A simple, elegant, yet memorable design of a single maple leaf on the reverse, and a portrait of Elizabeth II on the obverse forms the identification of the extremely popular Canadian Silver Maple Leaf. These coins are legal tender bullions of Canada and are minted using highly advanced technology involving amazing security features that give the coins a distinguished look. Face Value of 5 Dollars. Legal Tender issued by Canadian Government. Struck at Royal Canadian Mint, Canada. 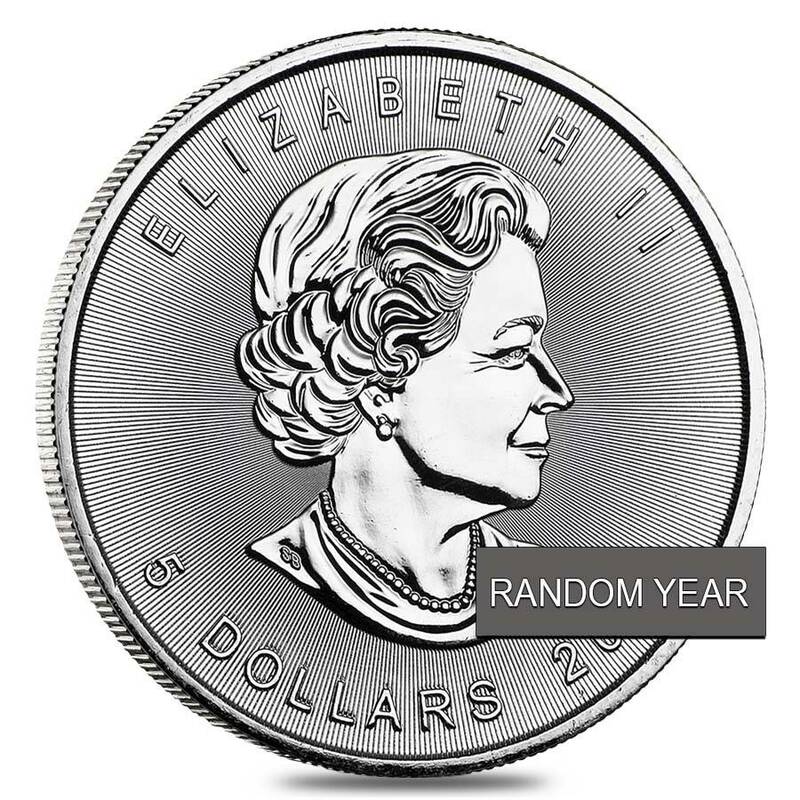 Obverse: Features a right facing bust portrait of Queen Elizabeth II along with year of mintage. Reverse: Depicts Canada’s national symbol, the Maple Leaf along with weight and purity. Individual coins are shipped in protective plastic flip. Multiples of 25 are shipped in original mint-issued tubes. Dates will be chosen randomly based on availability. 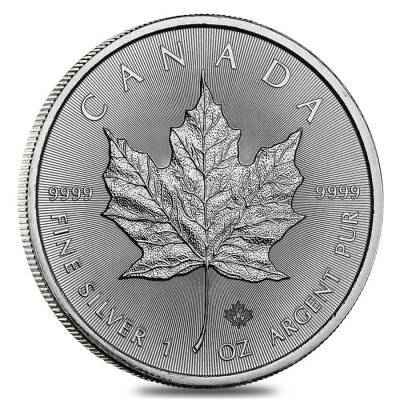 Why Buy Canadian Silver Maple Leaf Coins? They are legal tender issues of Government of Canada. These Canadian silver coins are extremely popular and well-recognized. Guaranteed by the Royal Canadian Mint for its weight, content, and purity. Silver Maples are affordable compared to the Gold Maples. Strong security features added to each coin since 2014. They can add to the diversification of your investment portfolio. 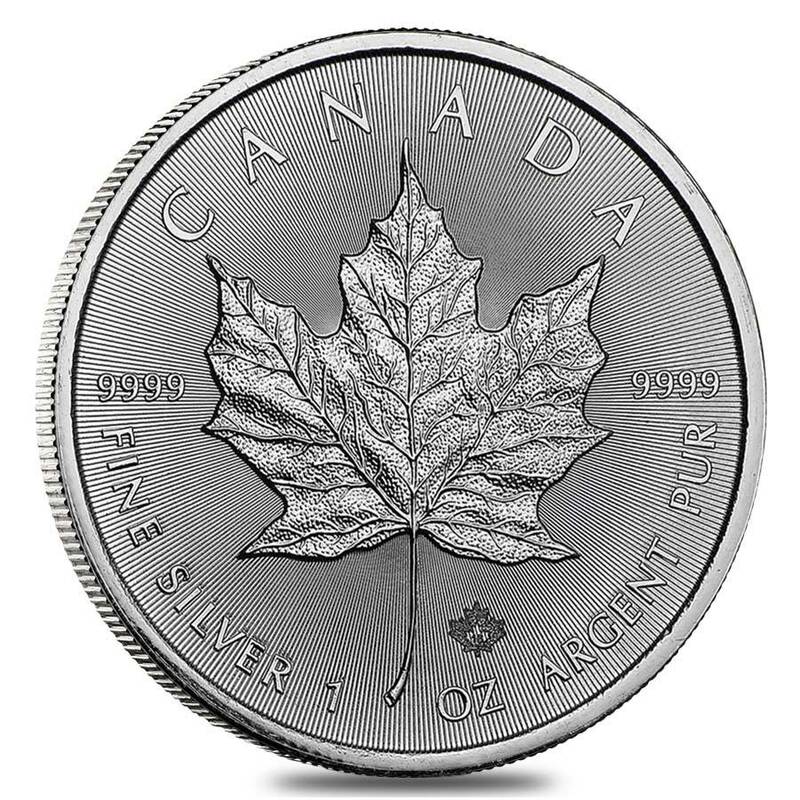 The Canadian Silver Maple Leaf is a premier investment grade bullion coin issued by the Government of Canada. The coins were first minted in 1988 by the Royal Canadian Mint. Although, initially the coins were struck in abundance of 1 million, there was still a huge demand for these coins. Some years saw very limited mintage of these coins. In the recent years, a large quantity of these coins are minted and yet the demand is still soaring high. These are highly desirable coins that are preferred by a majority of investors and collectors throughout the world. The coin is one of the top class bullions in the world because, they are minted using state-of-the-art technology and maintains a high quality of production with an impeccable finish. The main advantage for these coins in comparison to other world bullions is that they have anti-counterfeit features to boast off making It is impossible to counterfeit these coins as security features were added to these coins in 2014. This includes radial lines which emerge from the center of the coin which creates a light diffracting pattern achieved by the specific width and pitch of these lines. This feature is unique to only the Canadian Maple Leaf Bullion coins. On the reverse, the coin features a special micro-engraves security mark, which is a small textured maple leaf mark. The middle of this maple leaf bears the year of mintage. The coin has featured the same reverse design since 1988. However, the obverse featuring a right facing bust portrait of Queen Elizabeth II has varied, as it has been done by three different designers and used on the coin at different times. From 1988-1989 a design of the queen by Arnold Machin was used. From 1990-2003 a portrait by Dora de Pédery-Hunt was used and from 2004 to the present date, a portrait by Susanna Blunt is used on the obverse. The coin is given a face value of 5 Canadian Dollars. It must be noted that when you are buying random years, you will get a coin minted between 1988 to the present time based on availability. We clearly notify that the coins that were minted before 2014 do not exhibit the security features. It is only in 2014 that the security features were added. 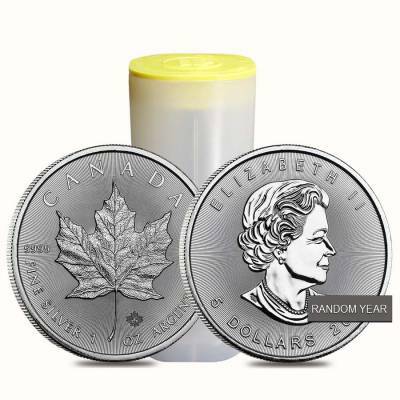 Bullion Exchanges is pleased to offer the 1 oz Silver Canadian Maple Leaf BU (Random Year) at one of the most competitive prices in the industry. Protect the brilliant uncirculated condition of your Canadian Maple Leaf by storing them in a mint-issued tube. 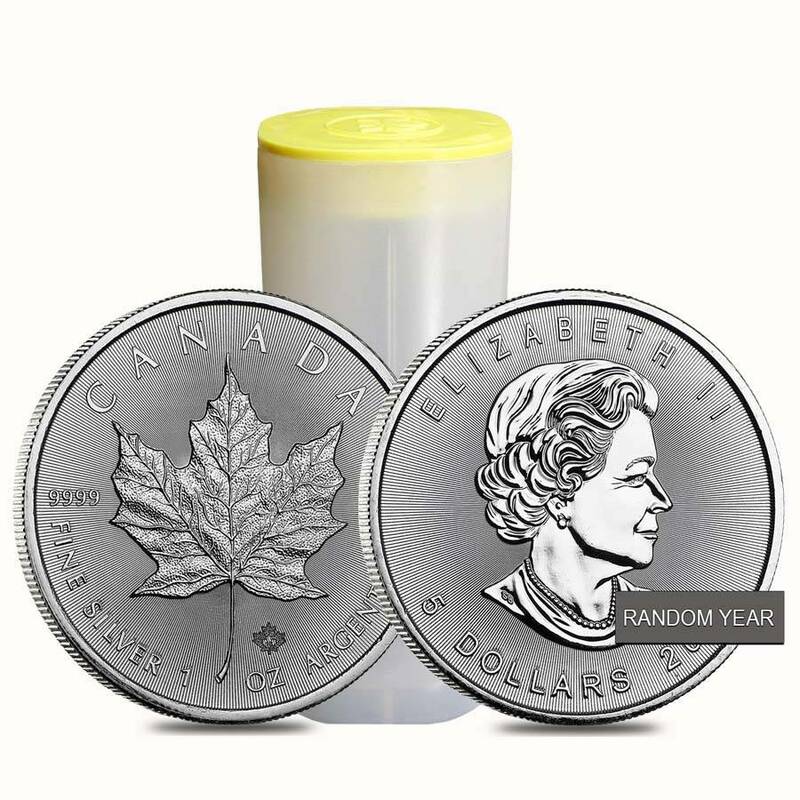 Place an order for a Canadian Mint Empty Tube along with your coins now. Browse our vast collection of Canadian Silver Maple Leaf series now. Also check out our other collections of American Silver Eagles and Chinese Silver Panda. Feel free to contact us at 800-852-6884 if you have questions in regards to any of our products. My first purchase with Bullion exchages will buy more and more. Item arrived as advertised in perfect condition. Bullion Exchanges provided excellent customer service. I was very satisfied with my experience. Thank you, guys!!! I appreciate when the ordering process is effortless and fast! My coin was delivered exactly as shown! Excellent quality and great deal! I would say Canadian bullion coins are an affordable way to invest. Good coin condition and not pricey! The details of this beautiful coin are stunning! So delicate and painstakingly struck - I love it. Ordered it two days ago and already received it. Excellent service! Bullion Exchanges is a great dealer. I have ordered several times before and will continue! Maple Leaf is one of my favorite design. With this purchase, you earn 18 Bullionaire Bucks 18 BB = $0.02. We currently have 1353 of this item in stock. For every $1 spend, you will earn 1 Bullionaire Buck which is equivalent to $0.001 off a future purchase. 18 BB = $0.02.